This is what you get for your 100 mile race when you are “Crewed by Clemens”! I had made it through the lottery for the 2015 San Diego 100 and was looking forward to the challenge. Unfortunately, life got in the way. Physical, mental, and emotional ailments took their toll on my training and I withdrew my race entry. Around the same time Tim Hackett asked Tyler to help pace and crew him. I still had a campsite booked, my weekend open, and a yearning to see the course. Aight Tim, you got us…get ready to be Crewed by Clemens! Friday afternoon I left Santa Barbara for the long (very long) drive through Los Angeles traffic to San Diego. Around the same time Tyler left Oregon and flew to the San Diego airport where I picked him up at 10:00 PM. We drove an hour east to the Cleveland National Forest, Tantor slowly chugging his way up the mountains, and pulled into our campsite on the shores of Lake Cuyamaca way after pre-race bedtime. I backed the van into our spot and popped the top. Tyler crawled into a sleeping bag above and I settled into the foldout bed below, we would be waking up in just 4 short hours for the start of the race. Saturday morning two alarms went off at the same time, one in the top bunk, one below. Both of us stirred a bit, neither wanting to get out of our sleeping bags. I checked the thermometer, 59 degrees inside, 46 degrees outside. Brrrrrrrr! It was going to be a cold morning, but more importantly, it would be a bitterly cold night crewing and pacing Tim through the Southern California mountains. Tyler and I layered up, made coffee with my Jetboil, and walked to the race start. We found Tim at the check-in table along with Jody Koehler who had flown in from Texas to complete Tim’s crew. The start time neared and runners grouped together in the parking lot. The rest of us stood to the side as the director counted down, “5, 4, 3, 2…” and they were off. In 99.9 miles, if all went well, they’d be returning here to finish the race. Team Hackett drove to the first crew accessible aid station at mile 23, it would be nearly 5 hours before we’d see Tim. 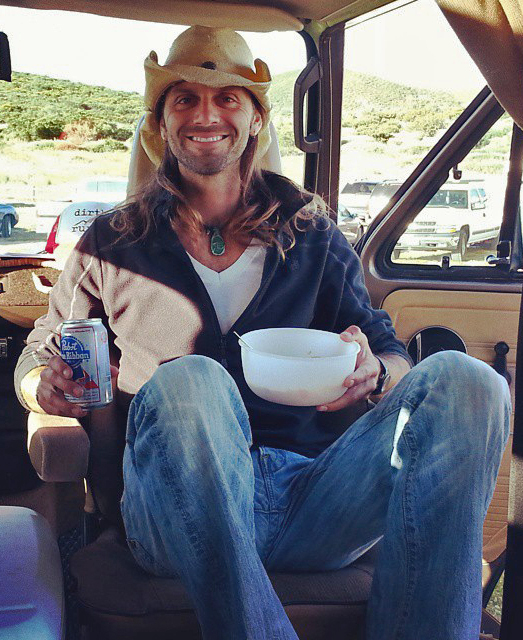 We parked the Westy, popped the top, and made the breakfast of champions, oatmeal and PBR. Tasty! Jody was training for her own 100 mile race in just two weeks and used the morning hours to nail down a 20 mile run. Other crews started to arrive and we all pulled out camp chairs to await our runners. We made new friends and shared adventure stories. One by one runners came through and departed, followed by their crew caravan. Tim reached the first aid station looking strong, happy, and ahead of schedule. He grabbed some quick aid and plodded back out onto the trail. Well, our work here was done, time to move on. We drove a few minutes up the road and waited to see Tim 7 miles later. 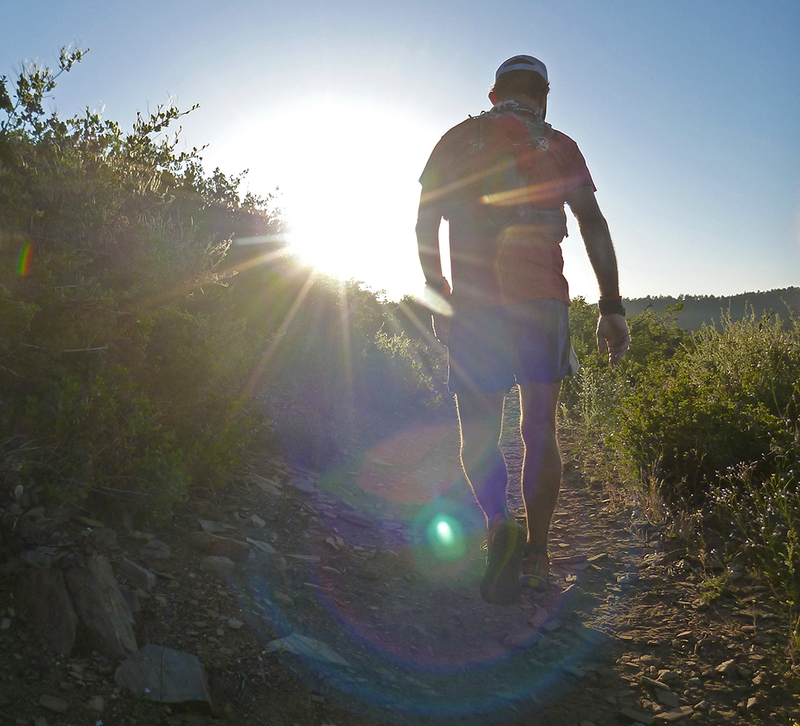 By the time he hit the aid station the temperature had warmed and the trail was open and exposed. I soaked his bandana and hat in ice water, Jody applied lots of sunscreen, and we sent him on his way carrying a few triangles of quesadilla, something that would come back to haunt me later. We drove ahead to mile 45 and while we waited Tyler and I did what the Clemens brothers typically do, popped the tops on a few PBRs. 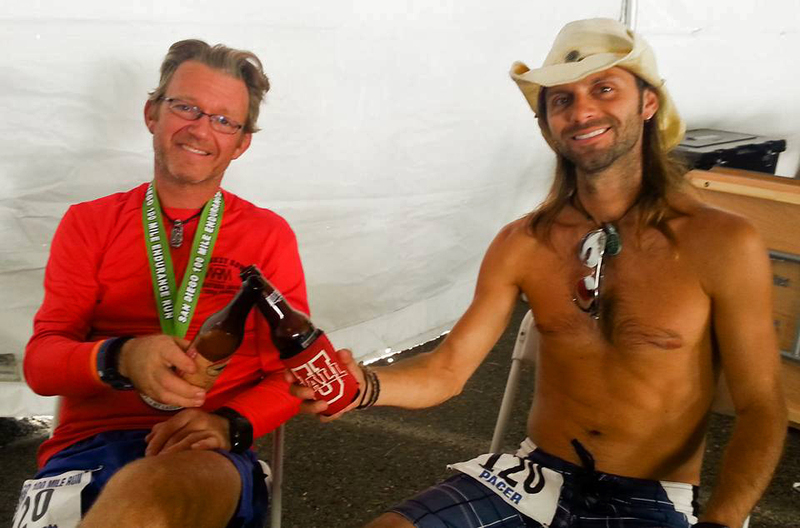 Tim came tearing into the aid station and as we walked to the food table I passed him my beer. He graciously accepted the cold can, quickly downing it for calories, pain prevention, and pure joy. 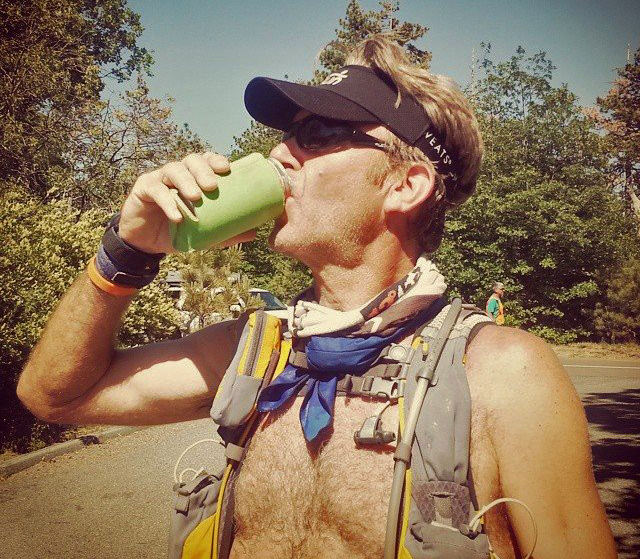 Wait…beer at mile 45? Well, yes…this is what happens when you are Crewed by Clemens! Tim was still moving strong, a little warm on the trails, but overall in great spirits. Mile 51 was the turnaround point and we packed him full of calories and water before sending him on his way. Tyler jumped in the driver’s seat of the van and he and Jody wished me luck as they dropped me off at mile 56 where I would begin my pacing duties. Tim tore into the aid station and I refilled his hydration pack while he chitchatted with the volunteers and devoured more quesadillas. We grabbed a few bites for the road and started walking down the trail. The next 8 miles would be a long technical downhill and Tim was looking forward to it. Rounding a few mountainsides Tim had settled into a pace that was actually pushing me pretty hard. I was amazed at his strength and struggled to keep up. We had a good conversation going, discussing the meaning of life, love and women. God must have decided that were too close to figuring it all out and he sent down his wrath upon us. Well, at least on Tim. We were deep in discussion when Tim must have hit on something a little too close to the secret of love. A rock jumped out in front of his foot, or God put it there to correct him, and I proceeded to watch the longest fall in human history. Tim tripped, lurched forward, and somehow got a foot under him. Whew, that was close! I felt better. Then, as soon as he balanced himself, another rock jumped into his path and he was teetering downhill again. Oh no. Gravity continued its pull, he put his hands out, caught himself on a few rocks, and barrel rolled over his shoulder onto his side. I rushed to see if he was okay but he continued to slide down the embankment. When the dust finally settled he was laying upside down, head toward the valley below and feet pointing at me. “Tim, ya dead mon?” I tried my best Cool Runnings impression while seriously examining his extremities to make sure they were all facing the right way. He moved a bit, rolled over, and stood with no pain. Good. We had escaped the wrath of God with only a sprained thumb, which hurt, but wouldn’t keep Tim from running the next 40 miles to victory. Even after the “longest fall in human history” Tim was still in great shape, bombing down the rocky technical trails like Kilian in Unbreakable. Tim, placing his feet perfectly, would reach the bottom of the descent strides ahead of me, turn around, hoot and holler and say, “Yeah man! That was rad!” I’d arrive, panting, thinking “Jesh man, I can’t keep up with you and you’ve already run 60 miles!” Tim was stoked. I was impressed, and out of breath. We completed the rocky downhill section and stopped at the next aid station just as the last daylight faded into pitch black mountain darkness. Tim was happy to have covered the technical trail in the daylight. We grabbed more quesadillas and water, donned our headlamps, and turned for the 8 mile uphill climb back out of the canyon. We reached mile 72 and Tim was moving strong and had passed a lot of other runners in the last 16 miles. I grabbed Tyler and gave him an update up Tim’s progress while Jody refilled Tim’s pack and made sure he had enough fuel for the next stretch. He put down another few quesadillas, I warned Tyler to not run too close behind him after so much cheese, and we sent them out into the darkness. Jody and I drove to mile 79 and Jody briefly napped in the van while I waited with friends for other runners to pass through. Eventually we saw Tyler and Tim’s headlamps bouncing toward us and we refilled their packs, gave them extra warm layers, and watched them take off into the night again, still moving strong. We drove 9 miles ahead, parked the van, popped the top, and this time both Jody and I took an hour nap. When I awoke I walked down to the aid station and shivered in the frigid cold air. Tyler and Tim eventually came in, but their pace had slowed a bit and Tim was looking rocked. We fueled him with cold Starbucks espresso and hot noodle soup. Tyler was looking beat and frozen too. I grabbed more layers from the van and they departed wrapped in warm sweatshirts. Jody had to get back to Texas for work on Sunday afternoon, so she wouldn’t be able to stay for the finish. She had helped us get Tim to mile 80 before I dropped her off at her car so she could drive back to the airport. With the crew down to just me I drove to mile 93 and laid out a sleeping bag between gear boxes and food bags to catch another short nap. I knew I needed to be ready for anything. The sun rose and the aid station started waking up. I sat in a camp chair and waited until I saw two familiar bodies walking in. I took Tim’s pack and started refilling it with water and fuel. He absentmindedly grabbed bits and bites to eat from the aid table before escaping to the restroom. I looked at Tyler and read the blank stare in his eyes. He had been out on the trial with Tim all night and looked completely depleted. At least Tim was 90 miles into his 100 miler and on autopilot, but Tyler had not gotten much sleep the previous night and the halfway naps hadn’t given him enough to cover the last 30 miles of the course in coherent pacer shape. If I sent them back out on the trail together it would be a weird rendition of the Pied Piper, with the exhausted leading the uber exhausted. I quickly ran back to the van, changed into running clothes, packed some food and water, and made it back to the aid tent just as Tim returned from the restroom. “It’s just you and me buddy, we got this!” I cheered to Tim. He looked back, didn’t say anything, grabbed some food for the road (no quesadillas this time, thank God) and we took off walking. Tyler had informed me that the last 5 miles had been pretty rough on Tim (well, both of them) and he was down to mostly walking. Tim also emphasized that we’d be doing a 7 mile trudge to the finish and not to expect much. I settled into the pacer’s place behind my runner and gauged his footsteps as we traversed a ridge and finally hit the direct sunlight, thawing our frozen bodies. Tim was moving slowly, but still upbeat. He filled me in on the last 20 miles and talked about a few other topics, but mostly stayed quiet and focused on the trail. He was dozing in and out of sleep and I tried to keep him engaged without wearing him down with conversation. We watched as the forest around us woke to the new day. Wildflowers in vibrant colors opened to meet the sun, wild turkeys in meadows gobbled to alert our presence, and a skunk jumped out on the trail just ahead of us. Ironically, a skunk had met me on the trail at mile 94 in my own 100 mile race last summer. Luckily, neither skunk decided to spray. We crested the last climb and Tim was home free. We followed the trail down the mountain and I tried several techniques to get Tim to run, but nothing worked. He was dead set on walking to the finish, saying this was a good time to be “old and wise” and not try to run, sprain an ankle, and give up a finish. He did try running once and pushed a solid jog across a flat section and even up a small climb, but that was it until the last few feet to the finish line. Physically Tim was strong, and I was amazed at his power hiking pace, but it was his mental stamina impressed me the most. 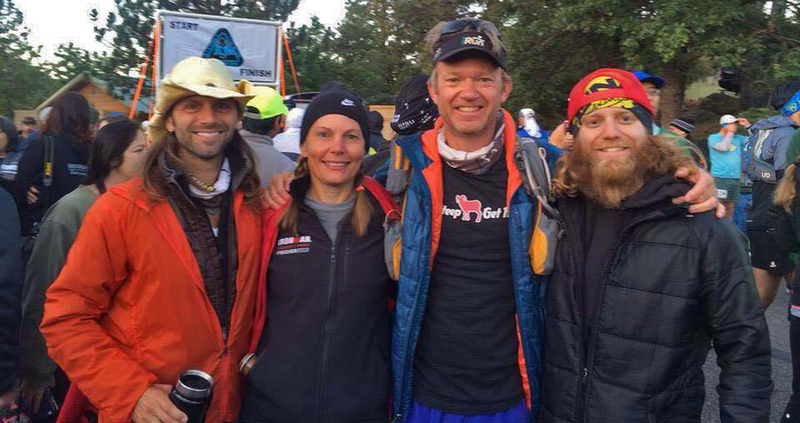 While Tyler and I paced him through dark, cold, mountainous miles he kept an upbeat spirit and positive attitude. On the contrary, when Maria Walton paced me through the night of my 100 miler I gave her a run for her money with my crappy attitude, complaining, and comments that I was sure I had thought but never verbalized, until she told me about them after the race. I was prepared for whatever Tim needed to release, but the negativity never came. The last 2 miles were some of the longest of his day. We were so close to the finish that we could hear the cheers at the bottom of the mountain each time a runner crossed the line. We were cutting it close to Tim’s 26 hour goal, but knowing that without running, we would probably just miss it. In true masochistic fashion, the trail actually wound right past the finish line by a quarter of a mile, only to turn back and lead the runners to the end. This was Tim’s breaking point. He finally gave up the happy demeanor and had a few choice words with the dirt he was traversing. I stayed behind him as we crossed the road, walked through a grassy meadow, and then climbed the last few dirt steps to the finish in the parking lot. The crowd erupted with cheers as I cut out and walked with Tyler to greet Tim on the other side of the finish line. Success! Tim was awarded his medal and belt buckle and we found a chair to rest his weary legs and cool down with an ice cold beer. More friends continued to finish while we added more chairs in the finishers tent. Cold beer was passed around and we devoured multiple hot dogs smothered with chili cheese toppings. Thank goodness I wouldn’t have to run behind Tim after that! A few of us took advantage of the cots in the back of the tent. 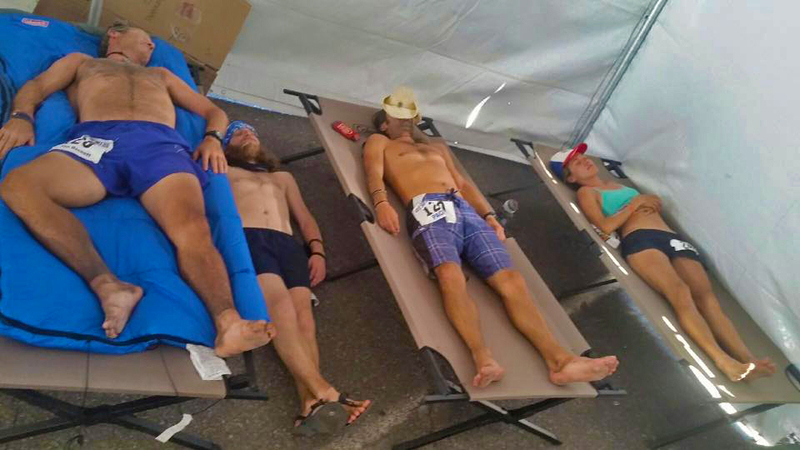 Two runners and two pacers, completely spent from running 100 miles, or driving from aid station to aid station, pacing and crewing for the past 26+ hours. We were all ready for a nap. After the race we all went back to the cabin to take showers and relax. Tyler had a flight back to Oregon that evening and I needed to get back to Santa Barbara for work on Monday. Someday I will learn that it’s not a good idea to try to drive home the same day that an ultra is finished. I’ve done it 4 times now, all with mixed success. After Western States I napped in a fast food parking lot, spent the night parked on a street in Paso Robles, and had to nap one more time along the 101 before making it to work on Monday morning. After crewing 60+ hours through Death Valley to Mt. Whitney I had to pull over 3 different times in the desert and sleep in the scorching heat, waking up in a puddle of my own sweat to drive a few more hours. After crewing the EC100 I left Santa Monica and took a wrong turn on the freeway, elongating my trip but making it back to Santa Barbara without a nap. I immediately hung my hammock at the beach and slept for hours, only waking up after the sun had set and I was almost frozen swinging in the cold ocean breeze. After dropping Tyler off at the airport in San Diego I made it to the Oceanside rest stop, pulled over, and slept for 3 hours with my van door wide open. I finally woke up as the sun went down and made the rest of the trek home, getting to Santa Barbara just in time to go to bed again. Yes, I wish I had run the San Diego 100 this year, but it just wasn’t in the cards for me. It worked out perfect that Tim needed a crew, and that we were available. We were able to spend the day helping a close friend reach his goal and inspire more of us to push harder, with a positive attitude. We met new friends, hung out with old ones, and celebrated their day together. 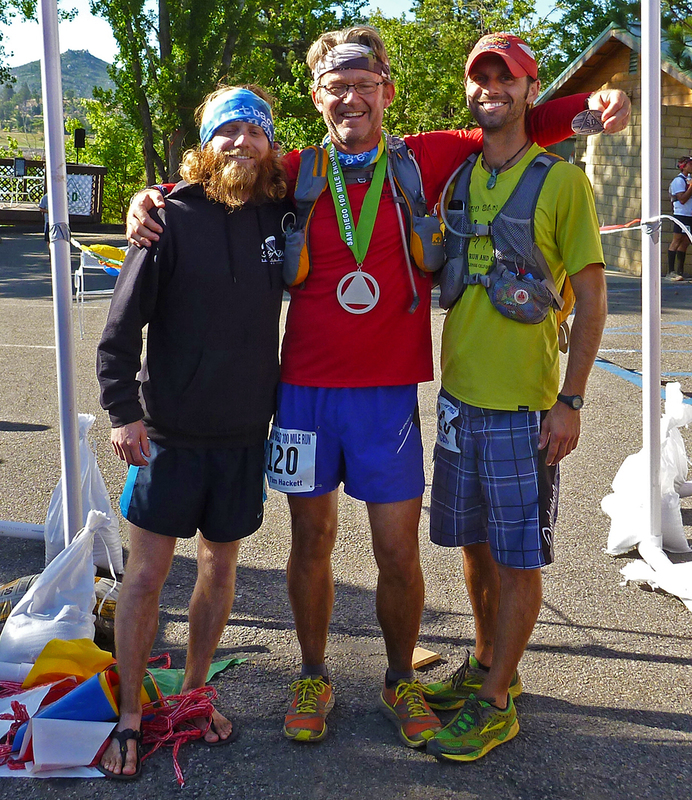 Tim was happy to be finished and joked that we were the only crew that could actually make him gain weight during an ultra. Too much beer and too many quesadillas. We were happy that Crewed by Clemens was a success! Ugh skunks…felt like they were all over the BR100 course after nightfall! At least you guys didn’t experience any cornfields or Aid Stations without coffee. Did anyone get lost on the course? Was this Tim’s first 100 miler? Stemen, no cornfields and the aid stations had lots of coffee, as did the crew! We stayed on course, and it helped that Tim has already done one 100 mile run, so we all came into it knowing a lot about what to do. It was still an epic weekend, lots of good stories, and fun to get him to the finish!